Retirement income planning is the process of understanding how much income you’ll need during your retirement years to support the retirement lifestyle you want, and positioning your assets to provide that income. While there’s no such thing as a “one size fits all” plan, there are steps you can take to help improve the possibility of a financially secure retirement. how to plan for when your retirement will start (including the impact of early retirement, delayed retirement, and working in retirement), how long it will last, and the retirement lifestyle you want. steps to estimate the amount of money you'll need in retirement to meet your goals, factoring in health-care costs, taxes, and inflation. how to supplement fixed income sources such as Social Security and an employer pension with your retirement savings, including the products and investment strategies you should consider, a sustainable withdrawal rate, and the right order to tap various accounts. You'll also receive a complimentary workbook created just for this presentation. The workbook contains key information, worksheets, and questions to help you remember important points from the seminar. Seminars held in the evening offer the full topic presentation at a dinner event. Seminars at lunchtime are a condensed version with the same core material at a Southeast Financial branch. Not able to make an event in your area? Sign up for the webinar to see the same great information from your home or office. After registering, you'll receive a confirmation email from MEMBERS Financial Services. Questions about this event? 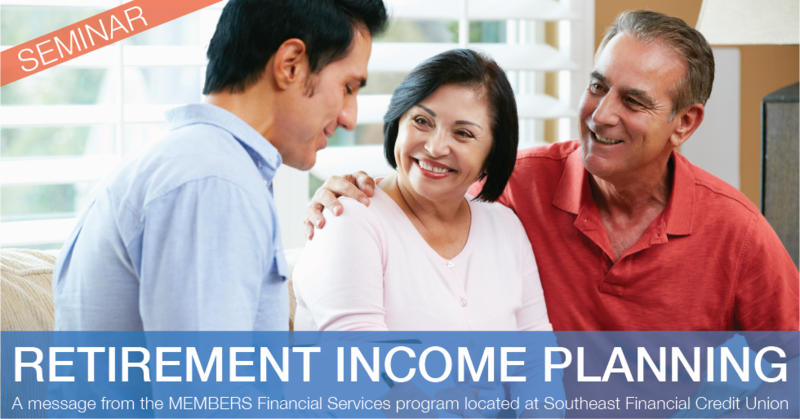 Email kwright@southeastfinancial.org.